Cyclocross - What Is It All About? If you are into cycling, then you should consider taking part in cyclo-cross. This type of cycle sport is one of the easiest to get involved in. Virtual beginners can participate as long as they register in the collect age group. It would not be surprising if you found yourself cycling alongside national champions in a cyclo-cross event. This is because professional and aspiring cyclists register for cyclocross events as a way of maintaining and improving endurance as well as using the event as platform to develop their cycling skills. Cyclo-cross races always take place in a relaxed, non-competitive and informal atmosphere. The event will be organized according to age categories. The races are time based and take place during the day. Cyclocross races are not technical in nature and therefore even someone with a mountain bike is free to participate. These particular races are organized in the winter and autumn. The events feature mass starts where all the riders start off from a common starting point. The races are usually one hour in length but tend to have a shorter time for the juniors, seniors and ladies. The juniors can participate in the races without having to pay an entry fee. The junior races are split into the under-12 and under-16 age categories. The cyclocross races are usually held before the end of July and during consecutive weekends in the months of October, November and December. Summer cyclocross are also increasing in popularity though these races are organized in a few places. Cyclo-cross races feature multiple laps with each averaging at one mile. Usually the laps are a lot shorter especially for the special races. These races are usually held on grassy courses in public recreational places and playing fields such as those in schools. Generally, the races are technically easy in comparison to mountain biking and thus rides are free to dismount and navigate artificial obstacles. Advanced riders will exhibit the skill for swapping. This is usually interchanged between riding and running. Some experienced riders are bound to overlap others but this does not mean the race has ended. Participants simply enjoy getting to compete against own selves in private battles. In cyclo-cross it doesn’t really matter whether one is leading or one is last in position. The overall objective of cyclo-cross of thus to offer a fun filled event where the success of the event is determined by individual participants. 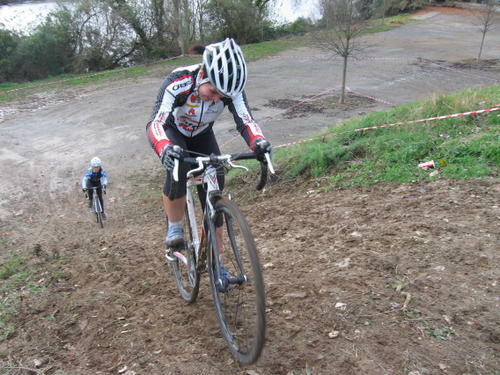 The bikes used in cyclocross events resemble the road bikes and feature dropped handle bars. There is also the presence of thin tyres. The cyclocross bikes also have knobbled threads on the handles for enhanced grip, low gears, powerful brakes and greater frame clearance that prevents mud from accumulating. This makes them ideal for cross cycling across muddy and rough paths. Cyclo-cross bicycles are also great for winter training or for use as utility bikes. They have a wide range or gears, which gives them a wide range of cycling options. This is why many professional riders use these bikes to maintain their physical fitness during winter.